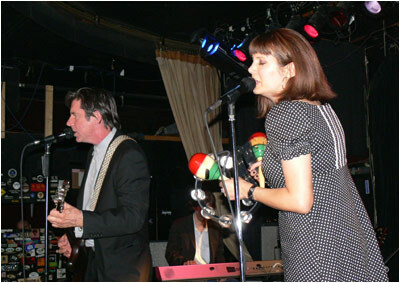 EvilSponge: Concert: JOHN DOE w/ Dead Rock West and A.M. I have to confess one thing up front: I'm not particularly fond of Smith's Olde Bar as a venue. Sure it's got really good AC (a major plus in Atlanta during August), the sight lines are really good, and the shows start early enough that I'm not in danger of turning into a turnip before the end. However, the beer is overpriced, the restrooms are wretched, and the sound mix is usually a little odd. 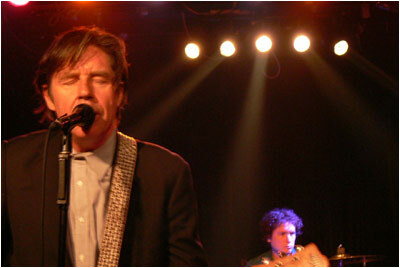 Nevertheless, a set by John Doe is enough to induce me to go to one of my least favorite venues in town. When we got into Smith's, the first act, a singer-songwriter going by the moniker AM, was already well into his set. I’m not usually big on this genre; however I have to admit that AM was rather good. Unlike many of his contemporaries, who play only rudimentary backing chords, AM's guitar work was both interesting and intricate. Likewise, his smooth rich voice would glide over the music, creating a nicely listenable sound. From his dialogue, I understand that several of his songs have been used on TV shows, and I can easily see why. His music is evocatively pleasant and smooth, without any rough edges that might startle a listener. But does AM's music get played on A.M. radio? After AM left the stage, Dead Rock West took a short time to set up. This four piece has drawn the inevitable comparison to X , which makes sense if you think about the shared male/female vocals, courtesy of guitarist Frank Drennan and vocalist Cindy Wasserman. However, I would argue that Wasserman's vocal range more resembles that of Neko Case (circa Furnace Room Lullaby) or Kelly Hogan. 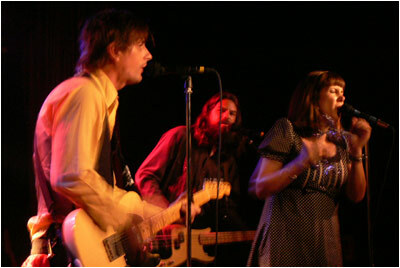 Similarly, Drennan's voice isn't the rich baritone of John Doe, but rather has the slightly nasal quality of someone like Scott Bondy (former lead singer of Verbena, circa Pilot Park). Furthermore, Dead Rock West's sound seems less outright punk than a mix of straight up honky tonk and heavier, late 60s style California country-rock. Finally, their occasional dark ballad brings to mind The Handsome Family, if they resided in the deserts of the SouthWest as opposed to Chicago. Dead Rock West in action. During this set, Dead Rock West came across well, with nicely done frenetic drumming and thumping bass cavorting behind the clean guitarwork of Drennan. The vocals were equally intriguing, although Drennan's voice was often mixed too low, so that Wasserman stood out more. More disappointingly, the overall mix was particularly odd, so that at times, really all that you could hear clearly were Wasserman, the bass, and an extremely heavy snare. Nevertheless, by the time the band closed out with their cover of Burning House of Love, it was obviously that the crowd had been drawn in by Dead Rock West and really seemed to appreciate their music. 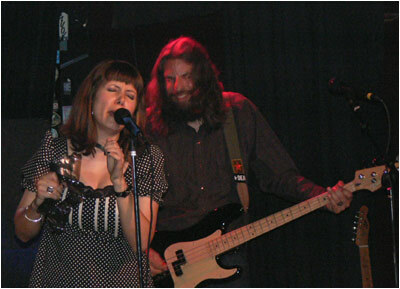 Cindy Wasserman, and evily grinning bassist. Finally, after a somewhat longer changeover that seemed a bit extraneous, considering most of Dead Rock West was the backing band, John Doe et al took the stage. Historically, I've always though of him as a particularly compelling solo performer. Doe has a mix of sheer charisma and humor which allows him to overcome people's X-centered expectations and be drawn into Doe's own music. On this evening, with his new album A Year in the Wilderness to support, it seemed like Does' performance was oriented towards a country-rock sound. While this may have disappointed some fans, I rather liked it, especially if you realize that my favorite solo album by him is, in fact, Meet John Doe. John Doe and his gravelly baritone. Unfortunately, just like the previous band, the mix was low-end heavy, which left Doe's baritone muddy and unfocused. However, Wasserman (who served up pretty harmonies) was again clear as a bell singing in the upper register. And when the band played the slower, quieter tunes (wherein the low end did not dominate), the distinctively mournful quality of Doe's voice and music became more evident and allowed the audience to appreciate his song writing skills. Still, it seemed like the largest applause was reserved for his renditions of the more familiar X material, including both White Girl and Fourth of July. Nevertheless, it appeared like everyone on stage and off was having a grand old time, and when they ended with a no holds barred, all hands on deck version of The Rolling Stones' Gimme Shelter, I thought Smith's might not be able to contain all of the energy and enthusiasm. Mr. Doe and Ms. Wasserman. In the end, I think it was a good night for music. 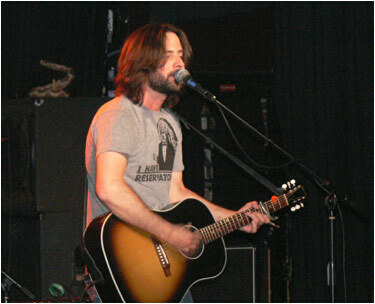 I certainly though AM was one of the better pure singer-songwriters I have heard in a long while. Dead Rock West were also quite good, and seemed to draw the audience into their music, hopefully exposing them to a larger audience. Finally, John Doe was as usual a very charismatic and compelling performer, whose musical performance was enhanced by the solid musicianship of Dead Rock West and lovely vocals of Cindy Wasserman.